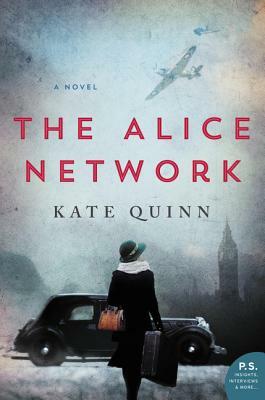 In an enthralling new historical novel from national bestselling author Kate Quinn, two women -- a female spy recruited to the real-life Alice Network in France during World War I and an unconventional American socialite searching for her cousin in 1947 -- are brought together in a mesmerizing story of courage and redemption. What a wonderful book. I loved it! The book is about two different women, separated in age by about 30 years, but both women have a common goal that throws them together. Eve Gardiner served in the Alice Network, which was nn actual spy group that operated in France during WWI. Charlie St. Clair is a young, pregnant unmarried American woman who comes to England in 1947 looking for her French cousin who was lost during WWII. Fate and a scrap of paper with Eve's name on it sends Charlie to seek out Eve. The book runs two parallel storylines - Eve's and Charle's and it moved back and forth seamlessly between the two timelines and the two wars. Eve's tragic story of her experiences in the Alice Network is revealed bit by bit in the story. When Charlie finds her in England, Eve is a drunk, foul-talking woman, living alone in a Londond house. But the common goal to find the man responsible for Eve's tragic story sends the two women on a quest to France. Back and forth we go as Eve, Charlie and Eve's man of general work - a young Scotsman named Finn, search for the devil that was Rene Bordelon. This story gripped me from start to finish! The real-life Alice Network was depicted so well by Ms. Quinn. Her fictional characters are mixed in seamlessly with the real-life characters of the network. I loved these two brave women, and I loved their story. Highly recommended.